Much better light transmission than plastic reflectors. 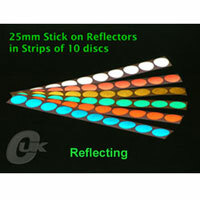 One unit = 10 discs of any one colour. Peel off and stick. See below for Unit Quantity Discounts.